My oldest has been back in school for two weeks and my family has been doing great with changing our breakfast habits. I have been the one the most in need of reform and I am glad to say that I have completely changed my bad habits. No longer do I reach for the cookies and sweets in the morning, but instead consistently eat protein and fruit. This has been a major change for me and I feel a lot better. I have also changed by kids diets pretty dramatically. We have always eaten well and I started cooking from scratch years ago. However, I have always baked a little too much and can be hit or miss with using whole grains instead of white flour. In the last couple of months I have changed these habits and my family has discovered that they love quinoa, whole wheat couscous and brown rice flour. My two boys have also been much calmer and stopped all the snacking they used to do all day without eating meals. One breakfast food that I have found that my whole family loves is smoothies. They are quick and easy and can be full of protein. 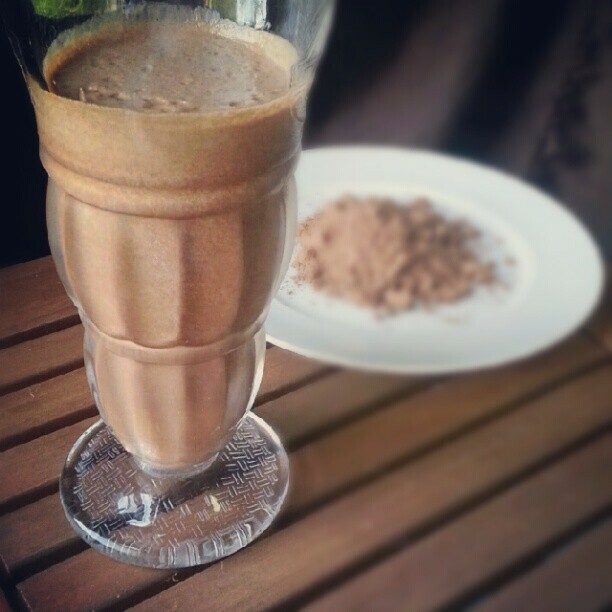 Last week I tried a new recipe for Peanut Butter Cup Protein Smoothies from the July issue of Family Circle magazine. This recipe has 6 ingredients. It takes 15 minutes to prep and makes 4 servings. I'm not really sure why the recipe states that it takes 15 minutes to prep. I was able to put together this smoothie in literally a couple of minutes. I chose to leave out the salt. I tasted the smoothie before adding the salt and I liked it the way it was. I try to avoid unnecessary sodium, so I chose to leave the salt out completely. I actually used vanilla flavored almond milk instead of soy milk. My family prefers almond milk and the remaining soy milk left in the carton wouldn't be consumed and therefore it would be wasteful. I followed the remainder of the recipe as written. Everyone in my house thought that this smoothie tasted like something from a juice bar. It is absolutely delicious and I love that it has 15 grams of protein. It does have 14 grams of fat, but since it's mostly from peanut butter which is a good fat I think that it is perfectly acceptable. Plus I don't believe in eliminating all fats from your diet, especially since my family is very physically active. One of the best parts about this smoothie is that it keeps you very full. I wasn't hungry until well after lunch so it was a great way to control my mid-morning sugar cravings. I have already made this smoothie two more times and it is sure to stay in my breakfast repertoire. For the recipe go to Peanut Butter Cup Protein Smoothie. Thanks :) Followed you back by email! If you end up trying it tell me how it goes :) I hope you like it! It's amazing what eating well will do for you. Ben's mom introduced him to protein shakes while we were in Tampa (he's not a meat fan like I am) and this looks fabulous! It'll be good to make it from scratch! Good for you and your family cutting back on sugar! It's hard in the beginning, but gets easier and easier. Yum! Now I'm craving a chocolate smoothie! I have everything but the yogurt :( thanks for linking up! They really are yummy and they would still work without the yogurt :) Thanks for hosting!